TV ratings are almost universally down. The format is suffering from strong competition from the likes of Netflix, Hulu, your uncle’s dodgy Chromecast app, and just good old peer-to-peer pirating. The season premiere of this year’s X Factor – a familiar talent show that usually signals to the TV-watching public that it’s almost Christmas – gathered a mere 6.9 million viewers at its peak. 6.9 million is hardly scraping the bottom of the proverbial barrel, but it is indicative of a shift in the way we communicate with our media. So what if I told you that a small Canadian webseries funded almost exclusively by a tampon brand has generated over 70 million streaming views to date? Chances are you haven’t heard of Carmilla, but the 220,000+ fans who successfully crowdfunded the series’ first feature film can certainly tell you a few things. The Carmilla series, a modernised take on Joseph Sheridan Le Fanu’s novella of the same name, relies almost solely on fan engagement to promote its content, with ‘zero paid advertising going into promoting the show’. Carmilla is a successful example of marketers targeting a largely untapped and ignored demographic – young lesbian or bisexual women. A profile of the series in The Wall Street Journal outlines how ‘the series was commissioned [by] an entertainment agency based in Toronto that specializes in helping marketers connect with millennials’. The clear drive to meet the needs of this demographic is reflected in the show’s honest portrayal of gay relationships, its approach to gender identity (with one character choosing to identify with they/them pronouns), and the rarity of having an almost exclusively female cast. The show’s leads, Natasha Negovanlis and Elise Bauman, are out queer women, as are the majority of the principal production team, adding a further layer of authenticity to the series’ diversity… but somewhere, in amongst all the drama and romance, you’ll find a brightly coloured box of U by Kotex tampons as a reminder of the series’ role as an advertisement. In an age where anyone can access a sheer volume of media that would have been perhaps unthinkable 20 years ago, young women are flocking to those shows and movies wherein representation of their lives is not a throwaway line or confined to subtext. These young women will tweet about their favourite shows, they will create art, donate money to the production of more content, create campaigns to protect their favourite characters, and they’ll do your PR for free. All because they care. 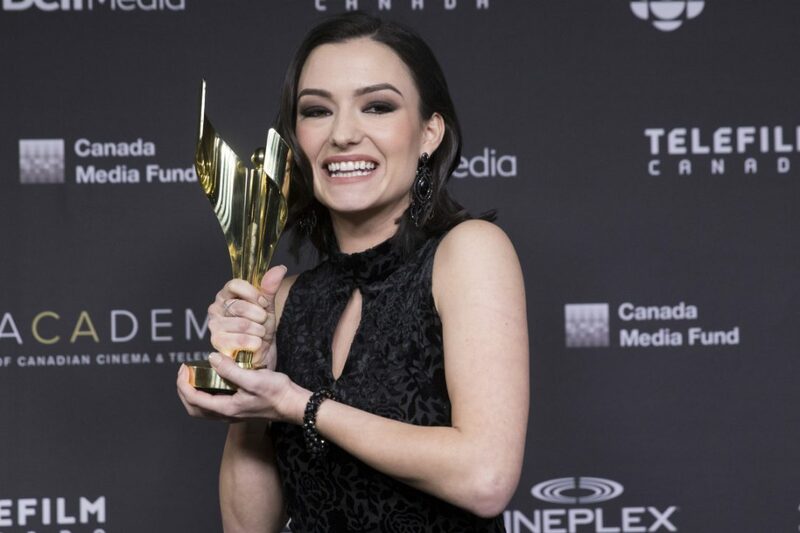 Recently, they voted in their droves for Natasha Negovanlis, who portrays broody lesbian ex-vampire Carmilla Karnstein, to win the Canadian Screen Awards’ Fan Choice Award, against actors from established primetime television shows. They’re currently participating in the #CreateACreampuff campaign, aiming to expose more people to the series in the run up to the film, offering incentives for promoting the show. The Carmilla team don’t have to send out press releases to media outlets, because there’ll already be a swarm of young women gunning to be the first to post about the new trailer or behind the scenes footage. They care, and they know others who identify similarly will too. The Carmilla Movie follows in the footsteps of productions like Almost Adults – also starring Negovanlis and Bauman – in delivering quality crowdfunded content for queer women; at this point, it’s tried and tested. That’s not to say showrunners and writers should exploit the large, vocal queer female fanbase for views or sales; however, they must certainly recognise that in a time where your show has to compete with an entire spectrum of other more relevant and tailored content, there are people out there willing to commit money and time to promoting your material. Jay Bennett, senior vice-president of Carmilla‘s production company Smokebomb Entertainment, describes this generation as ‘the most sophisticated audience in history’. In other words, blatant fan-service and product placement won’t win any hearts; a decent, normalised depictions of LGBT lives will. The Carmilla Movie is released on October 26th across VHX and select Canadian cinemas, and chances are you probably only know this because I’m telling you. Why am I telling you? Because I care, and because Carmilla is a prime example of how one mobilised demographic – young gay and bisexual women – will invest time and effort into promoting content that they see as celebratory of their lives, even if that content very subtly plugs feminine healthcare products. The movie, almost exclusively crowdfunded, is not affiliated with the U by Kotex brand, however it is important to recognise the brand’s role in the creation of a piece of media which has taken on a whole new life, and changed many others’ in the process. Visit http://carmillamovie.vhx.tv/ to find out more, watch the trailer, or even pre-order the movie yourself! Rebecca Toolan is currently studying for her MSc in Communication and Public Relations (with Political Lobbying) at Ulster University. You can find her on Twitter @vodkarebtools, and on Instagram @rebtools.